There's no mistaking a Zinger! The freshly picked taste of this luscious blend evokes thoughts of coming home at dusk with pails full of ripe berries bursting with flavor. We add hibiscus - the tart, ruby red herb that gives a Zinger its zing and blackberry leaves to layers of juicy berry flavor in this wonderfully balanced brew. 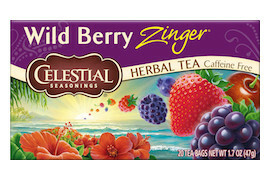 Ingredients: Hibiscus; rosehips; roasted chicory root; orange peel; blackberry leaves; natural flavors of: black raspberries, strawberries, blueberries, red raspberries, cranberries and cherries; citric acid; licorice root; and natural flavor. Contains soy lecithin.